The mountain-lion-hunting Twilight vampires weren’t the only bloodsuckers making a big splash at Comic Con on Thursday. While Bella and Edward entertained a packed panel in the convention center’s Hall H, Count Dracula held court in the Indigo Ballroom as Sony Picture’s Animation teased footage from its upcoming Hotel Transylvania to a packed house. The first “packed house” of the day, according to a Comic Con rep, who took the stage in the Indigo Ballroom to thank the hundreds of fans for coming before warning us, repeatedly, about the “not so nice” people with ultraviolet goggles who would be monitoring us for cameras. Apparently in Transylvania piracy is scarier than werewolves and Frankenstein monsters. Sony had reason to be cautions, though. 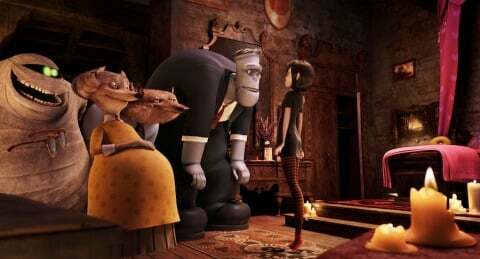 They brought a lot of footage from the animated comedy, which has Adam Sandler voicing the legendary vampire, who – in this offbeat imagining – runs an unconventional hotel where famous creatures of the night can rest in peace in-between scares. 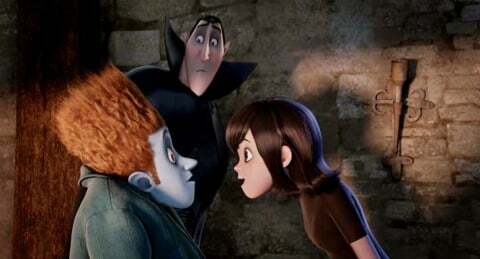 He’s joined by regular cronies Kevin James (as Frankenstein), David Spade (as the Invisible Man), and That’s My Boy colleague Andy Samberg as Johnny, a human hiker who happens on the remote hotel and promptly falls ion love with Dracula’s 118-year-old daughter, Mavis (Selena Gomez). The star of the panel, though, was director Genndy Tartakovsky, who has built up a sizable following in the animation community with his work on Dexter’s Laboratory, Samurai Jack and Star Wars: The Clone Wars. Many in the room seemed to turn out to see how he’d approach a classic horror comedy with a stable of vintage monster-movie creatures. So it was a lot of fun to hear Tartakovsky reference Abbott and Costello when he spoke of “stretching and pushing and pulling” at the mythologies of Dracula, Frankenstein and their crew to find the “cartoony” side of animation again. Producer Michelle Murdocca joined Tartakovsky on the panel and spoke of the “big and crazy and broad” nature of the humor in Hotel Transylvania. And the clips they showed backed that up. What did we see? The panel started with a full trailer, establishing the nature of the hotel, the introduction of Samberg’s Johnny, and the troubles it will cause Dracula when this human falls for the vampire teen. Then Sony unveiled four never-before-seen scenes. The first one was short, and showed the monsters getting ready for Mavis’ birthday as Dracula warned them (for the umpteenth time) that humans are evil and want all monsters dead. The second sequence was much longer, and covered Johnny’s arrival in the castle. Dracula, obviously, freaks out and does his best to hide this unexpected human guest. This clip also explains why Johnny ends up wearing a purple Frankenstein costume for the rest of the movie, as Drac forces him to wear it and hide in plain site. This was an energetic clip that rocketed around the lobby of the hotel, showing off an array of visually creative monsters, from skeletons and witches to the foot of an abominable snowman and a giant spider. Monster freaks are going to love this movie. The third scene takes place at a pool party at the hotel, where Johnny – now a semi-regular in the joint – starts to spruce up Dracula’s rather humdrum activities. Though a Bingo scene with whispering skulls in place of ping-pong balls was very funny, the clip stood out for its non-stop movement. A scooter really speeds up an otherwise dull game of charades. A sea monster invades the swimming pool, allowing Frankenstein to belly flop from great heights. Mavis offers Johnny her bagel with “scream” cheese … a running joke that got funnier as it played out. Hotel Transylvania has some inspired physical comedy. Tartakovsky wisely saved his best bit for last: A confrontation between Dracula and Johnny in a ballroom filled with tables. The director said it is a “big emotional moment” for Dracula, though it’s also a massive action set piece involving levitating tables that Drac and Johnny are flying like magic carpets around the castle. I’m going back to Hotel Transylvania just to see that sequence again on the big screen. Tartakovsky ended the panel talking about bringing energy back to feature-length animation and trying to channel old animation that remembered to keep the cartoons moving at ridiculous speeds. He seems to have achieved that with Hotel, and while he still needs to add musical cues and fine tune some of his visuals, I’d say we’re in for something special come Sept. 28.